Aluminium Punt - Commercial in-survey Class 1E passenger vessel for 20 passengers and 1 crew, launched October 2016. New vessel, built by experienced operator for a missed business opportunity. Cost over $170,000 to build, now heavily discounted for a quick sale. Vessel is currently dry-stored, 22 hours use and presents in new condition. The structure - heavy duty all aluminium frame and topsides on 19 separate water-tight poly pontoons in a trimaran arrangement. This robust vessel is built to last (main frame 200 x 50). Please check detailed photos on structure, welds, cleats and rubbing strake. Engines, Electrical & Fuel system: Twin independent 60hp Mercury outboards with independent fuel systems. Cruise 5.8kn @3,000rpm, Top 12.2kn @ 6,000. Fitout: Upholstered seating, marine carpet, marine toilet, fresh water tank, sullage tank, insulated roof with LED lighting, roll-down clears to the forward area, rear area designed to carry up to 20 bicycles. 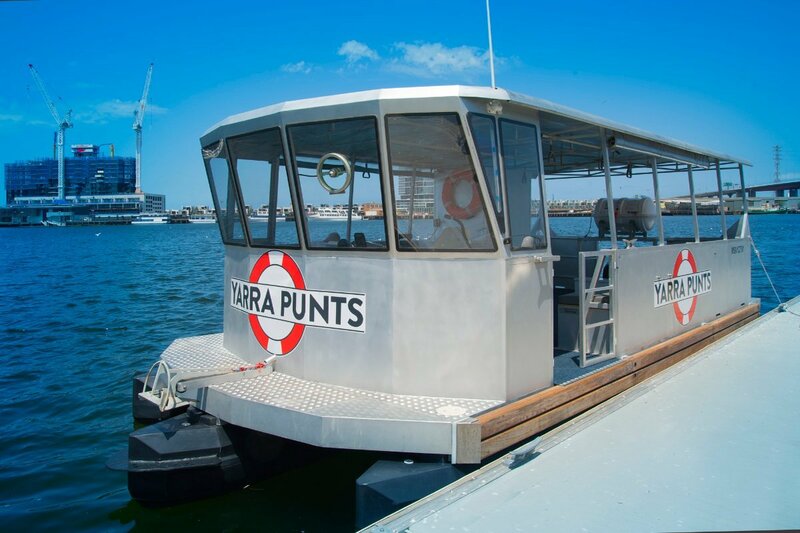 Originally built to service a passenger/bike ferry route to carry 20 passengers and bicycles, this vessel is ready to go for any operator wishing to transport patrons in smooth water operations. A new owner, by limiting the area of operation, could apply to substitute the ORIL for Karly floats and increase the carrying capacity of the vessel. Just add your new signage. We would be pleased to discuss transportation options. For more photos, please enquire on this site, and we'll send a link to you. Alternatively, enquire from this site to contact us for more information and vessel inspection.